Making Every Contact Count is an approach to behaviour change that utilises the millions of day-to-day interactions that organisations and people have with other people to support them in making positive changes to their physical and mental health and wellbeing. Making Every Contact Count enables the opportunistic delivery of consistent and concise healthy lifestyle information and enables individuals to engage in conversations about their health at scale across organisations and populations. Drawing on behaviour change evidence, the approach maximises the opportunity within routine health and care interactions for a brief or very brief discussion on health and wellbeing factors. A Making Every Contact Count interaction takes a matter of minutes and is not intended to add to the busy workloads of healthcare professionals and the wider workforce, rather it is structured to fit into and complement existing professional clinical, care and social engagement approaches. Evidence suggests that the broad adoption of the approach by people and organisations across health and care could potentially have a significant impact on the health of our population. Rather than telling people what to do, Making Every Contact Count is about recognising opportunities to talk to people about their wellbeing using the skills of asking and listening. It’s about enhancing the conversations we have. Our e-learning is designed to support learners in developing an understanding of public health and the factors that impact on a person’s health and wellbeing, emphasising how asking questions and listening effectively to people is a vital role for us all. This resource, composed of four e-learning sessions, is intended for anyone who has contact with people to Make Every Contact Count and develop public health knowledge. The package is part of a two-phase learning approach. The e-learning has been developed to ensure learners gain the underpinning knowledge and understanding of the importance of supporting people to improve their health and wellbeing and introduction to the practical skills to do so. It is about understanding – you will need to check in your local area how you access skills training. Completion of all 4 sessions, within this module, equates to 2 CPD points. This resource is composed of two e-learning sessions with additional resources around “MECC Plus for Integrated Care”. The focus is to give users the confidence to start a very brief conversation which will help the person involved to consider change, feel encouraged and supported to change, and know where to go for further support if they feel ready to change. The additional resources around MECC Plus for Integrated Care complete the toolkit and support the workforce to implement MECC based on Integrated Care principles and practice. They comprise case studies, PowerPoint and exemplar MECC pathways. The resources illustrate how brief person-centred conversations can support the holistic assessment of a person’s needs as well as enable the person to make changes necessary to improve their self-care management. A MECC PLUS Manual suggests bite-sized learning opportunities for managers and trainers to use with their teams. A MECC PLUS Pocketbook provides an aide memoire for all frontline staff. Brief Encounters: in this first session, there are six chapters and a Knowledge Bank. Visit the Knowledge Bank when directed to increase your knowledge and awareness. This first e-learning session, suitable for all frontline staff, is based on a simple ‘Ask, Advise, Assist’ conversation framework to enable all frontline staff to have brief conversations that raise awareness of wellbeing (and lifestyle behaviours), say something encouraging and supportive of making changes, and signpost to trusted sources of information and support. The focus is on all aspects of wellbeing. This e-learning session introduces the concept of wellbeing and describes how the ‘Five Ways to Wellbeing’ can be implemented in a variety of settings to promote it. This content was developed by Lancashire Care NHS Foundation Trust and adapted for national use by HEE. This session introduces the Five Ways to Wellbeing and how they can be used to support wellbeing conversations with people. Lancashire Care Foundation Trust would like to thank staff from the New Economics Foundation for their contributions and support in developing this session. If you already have an account with e-LfH, then you can enrol on to the Making Every Contact Count programme by logging in to the e-LfH Hub, selecting My Account > Enrolment and selecting the programme. You can then access the programme immediately in the My e-Learning section. 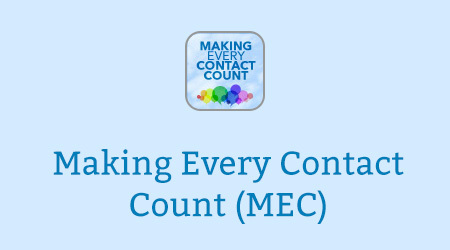 The Making Every Contact Count programme is also available to NHS healthcare staff via the Electronic Staff Record (ESR). Accessing this e-Learning via ESR means that your completions will transfer with you throughout your NHS career.